Are you looking for a complete course in Nepali which takes you effortlessly from beginner to confident speaker? 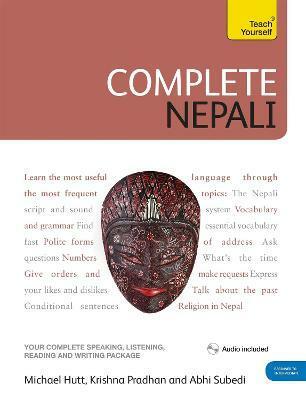 Whether you are starting from scratch, or are just out of practice, Complete Nepali will guarantee success! The audio for this course and a free essay on Nepali culture is available for free on library.teachyourself.com or from the Teach Yourself Library app. 02: How far is it to Kathmandu? 12: Where has he gone? 16: What should I do? 22: Shall I make tea? Michael Hutt teaches Nepali and Himalayan Studies at the School of Oriental and African Studies (SOAS), University of London. Krishna Pradhan teaches Nepali at SOAS. Abhi Subedi is a Nepali poet, playwright and essayist.